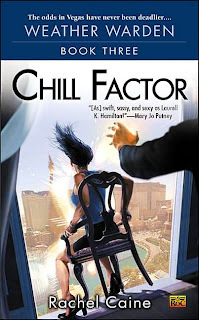 Chill Factor has a bit of the transitional novel feel to it as a new organization comparable (but sort of diametrically opposed) to the Wardens is introduced, exponentially complicating Joanne's life. Once again, every character except Jo seems to have layer upon layer of hidden motives. In some cases, (such as Marian Bearheart's) these motives made me want to cheer. In others, (such as Lewis') I felt a twist of pain in my gut and, even though he had a quasi-valid explanation, it still felt like betrayal and I didn't like it one bit. But I really did like the book and it certainly provided plenty of fodder for the coming books. Though this isn't the kind of book you'd want to, say, finish after all the bookstores have closed and not have the sequel waiting safely on your nightstand. You really wouldn't.